Product images can make or break your online shop’s success. You can hire the best designer in the world to create a killer design, but when images are bad, sales will be bad. It’s the first thing a customer will look at. That’s four out of five features that involve product images! In this post, we’ll go over a number of things you need to consider when adding product images to your online shop. For good SEO, you need a good user experience. 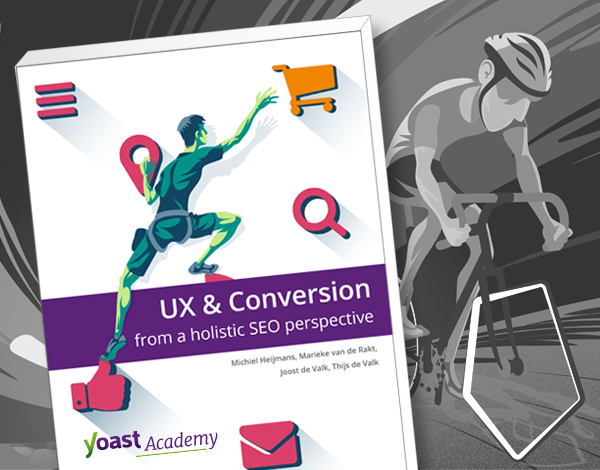 Learn about UX & Conversion! While I was (re)writing the article on the internal search for your online shop, I once again realized how big a role product images play in an online store. I was reviewing a site of a friend of mine and found that the images on his homepage just didn’t do justice to the products he sells. The images of his featured products simply didn’t ‘pop’. To demonstrate this, I replaced them with bright colored pictures and the website told a whole other story. One of the things we tell our customers is to use photos of people using the product. Or the product in use. It doesn’t matter if you sell coffee machines or dresses. If you add people, your product will look friendlier and people will see themselves using your products. See the difference? 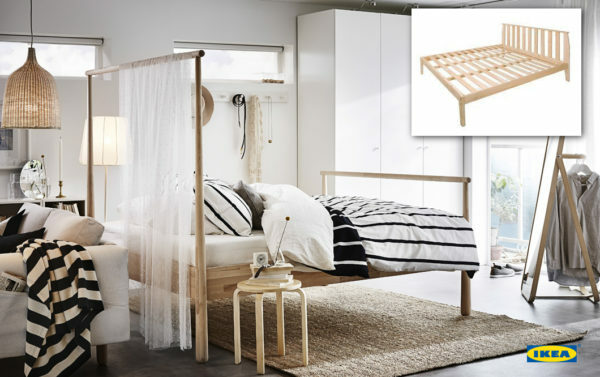 That Ikea bed is much more appealing. Ikea does a awesome job in this, both in their magazines, on their website and in their stores. Product images like this are becoming more and more common, so be sure you’re not the last one to do this! Using product images with the products in use works best, because people will be able to see themselves using that product. It’s as close as you can get to an in-store experience. People want to buy the product online, but an image will never replace picking a product up, looking at it from all angles or trying it on. We need to try to give our customers that same experience. For the same reason testimonials work so well, by the way. It seems so obvious to use high quality images. But we have been telling you to reduce the file size for years, right. First of all, that doesn’t mean you have to use a crappy, blurred image of just a few kBs. The tools mentioned in our image SEO article don’t reduce the quality of an image, for instance. They remove meta / Exif data and things like that, but your image will still look awesome. Secondly, internet connections are getting faster. We’re a lucky country, as in the Netherlands broadband internet is everywhere. There are just a few so-called white spots (locations with no internet at all), with a total size of a couple of baseball fields. That also means we’ll have less difficulties downloading your larger product image files. 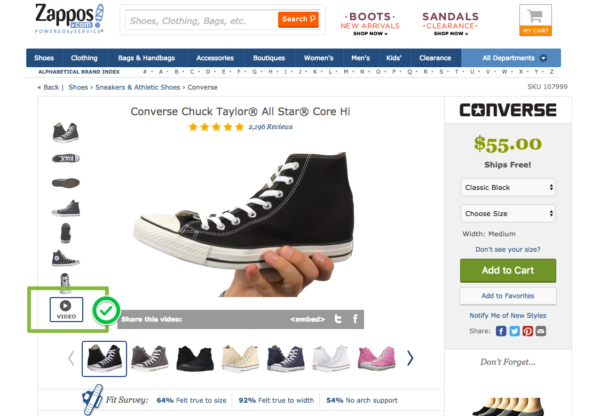 You’ll need larger images anyway, as that leads us to another necessary feature of online shops: ability to zoom product images. Have you ever picked up a backpack or daypack to inspect the lining? Is it waterproof, does it protect your stuff well? You want to be able to take a closer look at details. That’s what zooming product images is for. My personal pet peeve when it comes to this, is when the zoomed image is exactly the same size (or even smaller) than the product image that was already shown. This still happens frequently! A lot of online shops simply import product images from manufacturers (or even download them from other shops that sell the same product) without testing the image first. This ruins user experience in my book. 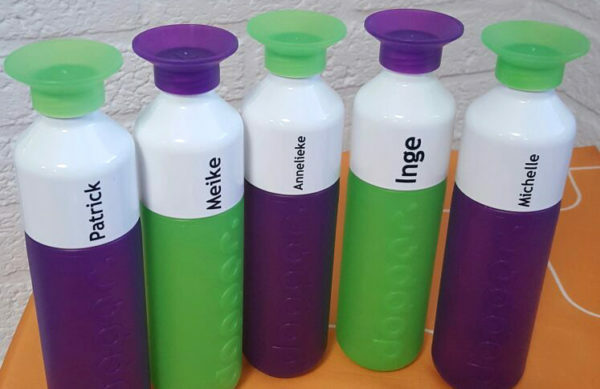 If there is no proper product image available, create one. Even your iPhone’s camera can provide you with a decent, large image that can serve as a zoomable product image. Your product images can be any size up to 2048px by 2048px, or 4.2 megapixels. […] Higher resolution photos will look more polished and professional to your customers, and we typically suggest 1024px by 1024px as a guideline for square product images. 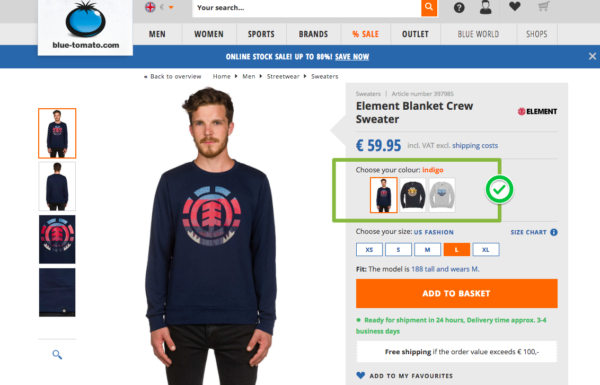 Woocommerce states that the minimum dimensions should be 800×800 pixels. That seems to make sense, as it will perfectly fit most tablets as well without any problem. Smaller will lead to distortion, and we have established you want quality images, right? By the way, Pixelz has a nice guide for DIY images for your shop. Find that guide here. We switched some tops and bottoms, by the way. Especially for products that consist of one main and a few other colors, this works really well. Make sure your customers find your products! 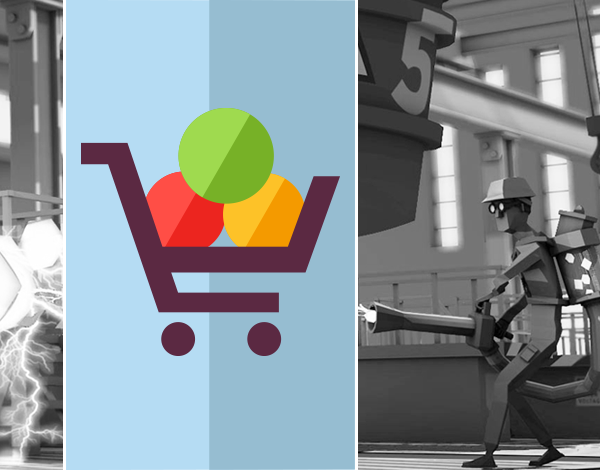 Improve the sharing experience for your social media with the Yoast WooCommerce plugin! You want to be able to look at a product from all angles. Let’s look at that blue-tomato.com example again. It shows that sweater being used, from the back and front, plus some details. You can really check the sweater from multiple angles. If you are looking for furniture online, you want to check that chair from multiple angles as well. You want alternate views for the kitchen appliances, even though you’ll hide the dish washer behind a cabinet panel. And let’s take a closer look at the fabric of those drapes, or the back cover of that book. Again, it’s all about replacing the in-store experience. The way that shoe is bent and rotated makes that you really ‘feel’ what kind of shoe that All Star is, so to say. I like that! provide alternate views of the product. These are the main things to take into account when optimizing your shop’s images. I trust this article will make you rethink your own product images, or make you realize you are actually doing a pretty nice job!